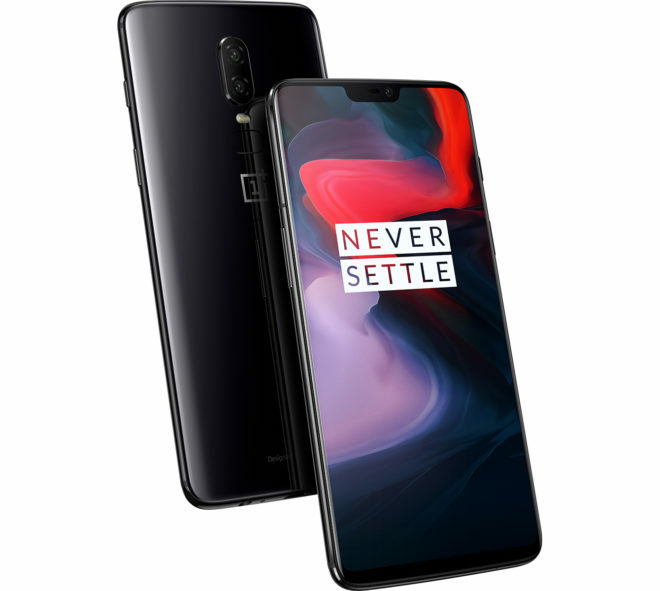 OnePlus phones are a popular option for customers that prefer unlocked devices, and today OnePlus introduced its newest flagship smartphone. 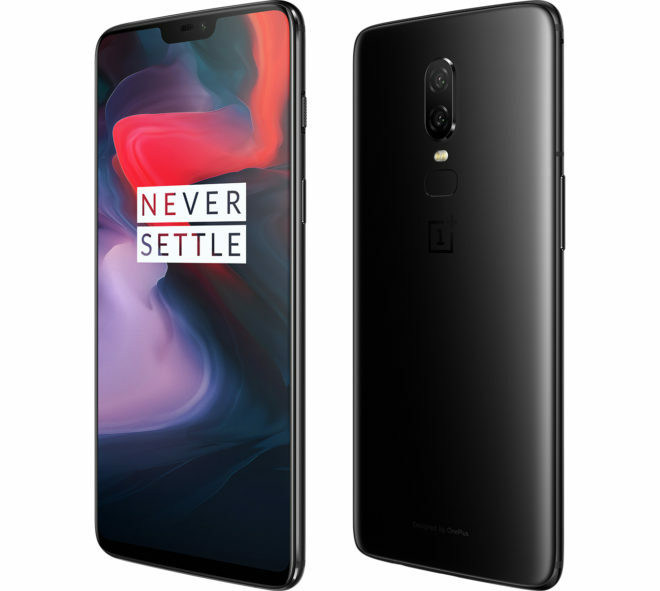 The OnePlus 6 features a 6.28-inch 2280×1080 AMOLED display with 19:9 aspect ratio. Like several other flagship phones that’ve launched recently, the OnePlus 6 does have a notch at the top of its screen that houses its sensors and 16MP front-facing camera. If you don’t care for the notch, OnePlus has said that it’ll let you hide it with software. Around on the back of the OnePlus 6 there’s a dual rear camera setup that OnePlus says it centered on the device for symmerty. The main 16MP camera has a Sony IMX519 sensor, f/1.7 aperture, and support for optical image stabilization, electronic image stabilization, portrait mode, and super slow-motion video capture up to 480fps. The secondary camera is a 20MP shooter with a Sony IMX376K sensor and f/1.7 aperture. The body of the OnePlus 6 features Corning Gorilla Glass 5, an alert slider, a USB-C charging port, and a 3.5mm headphone jack. Inside that glass shell there’s a Snapdragon 845 processor and a 3300mAh battery that powers the whole package. When it comes to RAM, there will be 6GB and 8GB options, while storage options will include 64GB, 128GB, and 256GB options. 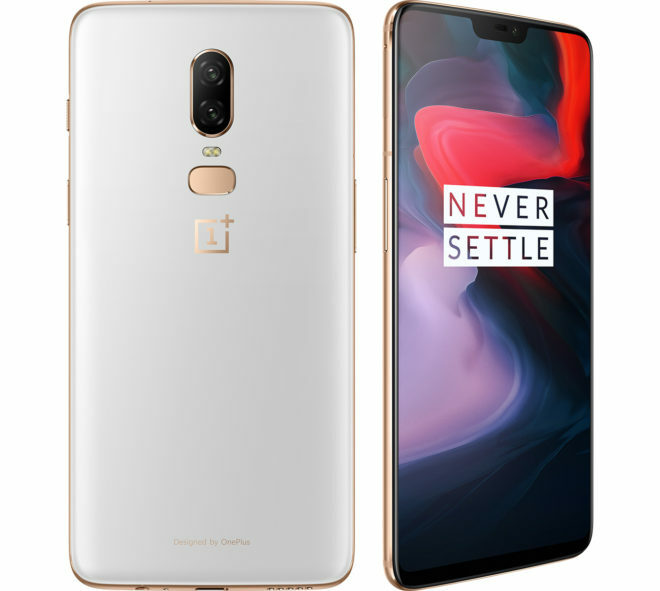 Other notable features of the OnePlus 6 include dual SIM slots, NFC, Bluetooth 5.0, an RGB LED notificatoin light, a rear fingerprint reader, and face unlock. On the software side, the OnePlus 6 runs Android 8.1 below OxygenOS 5.1. OnePlus’s custom user interface comes with features like gesture navigation and a gaming mode that’ll block incoming notifications and limit background processes to let you focus on your game. And if you’re itching to try Android P, a beta release will be available for the OP6 in the near future. The OnePlus 6 will be available starting May 22 in Mirror Black and matte Midnight Black color options, and a limited edition Silk White model will launch on June 5. Pricing starts at $529 for the 6GB/64GB model and goes up to $579 for the 8GB/128GB version, while the top-end 8GB/256GB model will set you back $629. OnePlus’s new flagship looks like a nice upgrade over last year’s model. The screen size has increased with a tiny increase in size, and you’re getting flagship-tier specs for a price that’s lower than many other flagships out there now. The fact that the OnePlus 6 isn’t available from T-Mobile may turn some folks off since you can’t buy it on EIP or JOD, but if you’re in the market for a new unlocked device, the OnePlus 6 could be worth a look. What do you think of the OnePlus 6? It’s the first non branded device that has band 71, so it could be a winner! Yup, as long as it’s safe to assume VoLTE works. VoLTE will for sure work, it works on the OP5 my co-worker has…so they ain’t about to remove it on this OP6. This looks like a very nice phone. Unfortunately, it’s just a bit too big for me. I need something around 5.8″ (or smaller) to fit comfortably in my pocket. Also, when you compare the price to sale prices for top end phones it’s a bit expensive (e.g., T-Mobile runs a BOGO deal every year for top end Samsung phones). Depends on the phone. My 6.2 inch s9+ is pretty much the same size the 5.5 inch iphone 7+was. Why can’t you buy this retail ? tmobile won’t sell it any cheaper. It will only sell a version with lot of bands disabled. It cuts out the middle person. It allows Oneplus to have full control over its distribution, not extra cost, and no contracts with distributors. This is still a pretty small company. Samsung can afford to ship thousands of phones even if they do not sell. OnePlus cannot afford to make extra phones that don’t sell. They have perfect number control. THey never need to make more than they sell. It also keeps cost down! It’s an unlocked phone….you buy it and toss your T-Mobile SIM in it. Zero emphasis on audio. Pass. So this has the 600 band in it correct? Yes. It supports all of T-Mobile’s and even Sprit’s LTE bands. Then what is the LAA band 46 that “riverhorse” brought up in a previous comment. Is it used often? and Is it totally necessary? Unique dimensions and screen size. Good to see consistent pricing from them. Not sure on the glass. No notch for me, love my s9! What is LAA (Band 46)? I’ve never seen that as a band on Tmobile. 1080p on a 6.28″ screen IS settling. It would drive the price up and battery life down. Good for VR, but with the Occulus Go, almost better to have a standalone device for that. Only $50 for another 2GB of memory and 64G of storage going from the baseline model (64GB) to the next (128GB). I’m impressed. Apple would have charged another $200. This company has such a cosmetic hard on for Apple. This is my first OnePlus Phone. Compare to my wife Samsung 8s Plus. Can’t tell the difference between the two in quality. Happy with this phone.